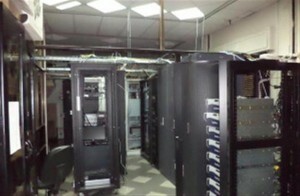 These Bluecoat servers are believed to be used by the Syrian government to censor the Internet. Photo credit: Cybercov. The weak network is not unique to the area where Rami lives; most areas under regime control have witnessed a severe decline in network performance, which seems above all to affect access to social networking sites and email servers. Qusay, 33, who studies information engineering at Damascus University and lives with his family in the Masaken Barzah neighbourhood, confirms this. “The network is fine when you’re accessing certain sites, but it becomes noticeably bad when you try to access social networking sites, especially Facebook, or to open your email server, particularly Gmail,” he said. Qusay says it’s become very hard it is to have a conversation via Facebook, since ones message won’t reach the intended recipient. “This makes us afraid that the reason behind this, as well as the weakness of the network infrastructure in general, is government spying and censorship of the Internet,” he said. Government control over the Internet network in regime-controlled areas is of particular concern to activists. Syrian activists benefitted greatly used the World Wide Web to great effect at the beginning of the popular uprising in March 2011, since it represented one of the best means of organizing meetings and coordinating activities in a country where freedom of political action is constrained and public gatherings are banned. Violation of these instructions is punished with a fine amounting between 100,000 and 500,000 Syran lira, the equivalent of roughly 670 US dollars to 3,300 US dollars. The organization “Reporters Without Borders,” has been quick to emphasize the issue of increased Internet censorship in Syria. In a statement released in May 2013, the organization denounced the fact that 34 servers in Syria were using the services of a company called “Blue Coat.” According to Reporters Without Borders, the company’s technology is used “to analyse and monitor the activity of Syrian Internet users: to block websites, intercept emails and gather details on the sites visited by Internet users….” The organization also declared Syria as one of the countries deemed an “enemy of the internet,” in a list they published in March 2013. But in most areas outside of regime control, there is no government network or state-run Internet service, so activists must find alternative options, like expensive satellite Internet connections. The Freedom House report says at least seven major cities have had their Internet infrastructure severely damaged, including Homs, Daraa and Aleppo. Ahmad Taha Abukhalil, the head of public relations at the Local Council for the city of Douma, confirmed everything contained in the report to Damascus Bureau. “There is no state-run service in any of the towns of Eastern Ghouta, with the exception of certain areas adjacent to those under government control, which can catch signals from their rooftops,” he said. As for how activists gain access to the network, they do so either through satellite Internet or through 2G or 3G networks, that is, through second and third generation cell phone network coverage. According to Abukhalil, the cost of building a local network before the siege was about 100,000 Syrian lira, and it has gone up after the siege to about 250,000 Syrian lira, when it’s even possible to secure it. When the town relies on the local telecommunications networks (Syriatel, MTN), a monthly capacity of 10GB costs 5,000 Syrian lira per month. As for satellite internet, when it was available, the average price was 2,000 US dollars, for a maximum capacity of 50GB over a period of six months, with most using an Astra-brand receiver.